It's not often academia focuses its lens on football, but one academic has completed a study of his favourite club - and a Belfast Celtic legend plays a prominent part. John Williams from the University of Leicester has published Red Men: Liverpool Football Club - The Biography, looking at the social and political history of Liverpool FC, the second team of the city founded a year after Belfast Celtic. Long before the Beatles set the British charts alight, Liverpool was getting a reputation as a city apart and the town's football clubs were no exception. Formed by John Houlding, who encouraged a split with Everton centred around Anfield Park, which he owned, it would be a rough birth for Liverpool's fledgling Reds. They had difficulty attracting any local players and looked to Scotland for staff, forming a 'team of Macs' to get off the ground - in fact for much of their early history, Liverpool was made up of players who didn't come from Merseyside. Recently, BBC Radio 4's Thinking Allowed programme interviewed John Williams on his new tome, and he brilliantly sketched the roots of the club, pointing out that Houlding and his other founders were; "Protestant, were Orangmen and Freemasons" but after the formative years of the club, "Religious differences never became as profound as they did in Glasgow." The famous Kop stand has become synonymous as another football place apart and a quick nosey on Youtube will show why, with footage from the sixities showing bowl-cutted Liverpool supporters beltng out 'She Loves You' by the Beatles for the benefit of a bemused television audience. But part of the Kop's reputation was built by one man - Elisha Scott - and the author and academic tells why; "We talk now about the Kop as being an exceptional place, for example and we think of that as being a modern construction, but actually, if you go back to the early years of the club, the Kop is being identified...and right in the early 20th Century you find examples of the humour and irony of the Kop." 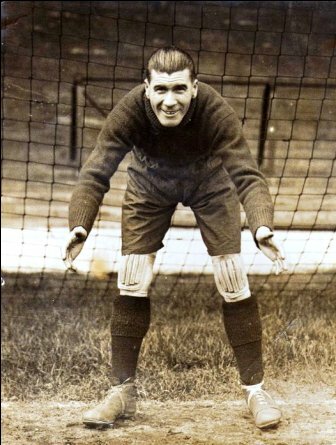 "The relationship the Kop had with a very famous and fantastic goalkeeper called Elisha Scott - Scott was much more in tune with the Kop than he was with his own players and in the 1930's he used to communicate directly with the Kop." It's hard to believe that in the middle of a game, the ever lucid Scott would ever take his eye off the ball to conduct a chat with fans on the terraces - but according to Williams, that's exactly what happened. It's well known that today's spoilt footballers are thought to be aloof from the reality of the ordinary fan, but this is not a new departure, with Williams relating that; "People complained in the 1890's that the team didn't represent them and that we needed more local players and actually, there are some players now, Jamie Carragher is a very good example, he is very like Elisha Scott...people in Liverpool still knock on Jamie Carragher's door." To hear the full Thinking Allowed interview with John Williams, please click here. 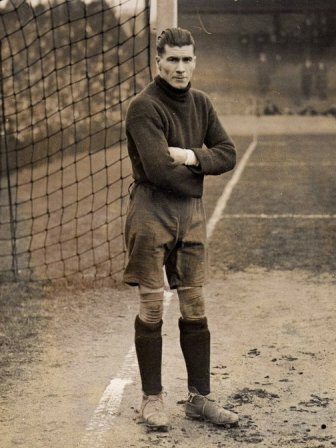 You can read more about Elisha Scott and other Celtic legends on the Legends pages. A special thanks to Elizabeth Hargreaves for the photos of Elisha in his prime.